Gobble, gobble, gobble. What will you be wearing when the air gets chilly and the leaves begin to fall? 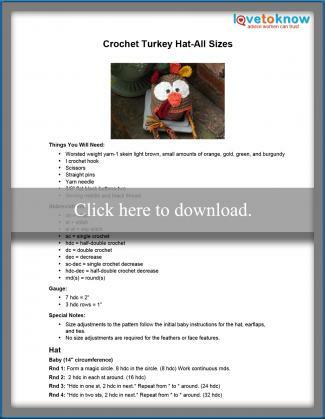 How about crocheting a turkey hat? Easy enough for a beginner, this hat pattern also includes instructions for all sizes so everyone in your family can be part of the flock. This hat pattern features earflaps to keep your ears nice and cozy and braided ties to keep it firmly in place. If a beanie is desired, both features can be omitted. Make these turkey hats for each member of your family. The following are a few tips on personalizing each hat, and ways your family can use them. Whether it is baby's first Thanksgiving or time for the family's annual photo session, seasonal photos will be adorable when they feature this turkey hat on everyone's head. Before you head out to the local pumpkin patch or take a family hayride in the country, make everyone matching hats. You will easily be able to identify your family members in a crowd, regardless of who has strayed from the flock. Individuality is important to kids. Choose different color shades for the hat or feathers to customize each child's hat. The basic hat pattern, with or without the earflaps, can be used as the base for other animals and seasonal novelties. Use your imagination to create a stockpile for dress-up, children's plays, baby's firsts, and holiday gatherings.